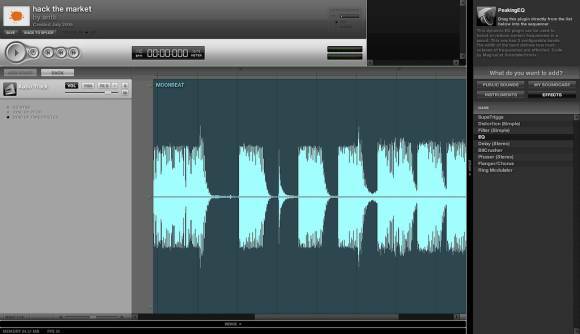 Splice’s new interface looks suspiciously like a desktop music application — and even allows real-time effects. Screen grab by our friend Marco Raaphorst; if you can read Dutch, he sounds very, very excited about this website. Real-time effects — yep, you read that right. You can actually apply common effects like flanger, delay, and distortion via the Web interface. Real-time effects and instruments in a Web browser? That’s a surprise. Java has made that possible for some time, but it’s new to Flash, and even in Java actual implementations have been few — let alone integrated in a full-blown community site open to the public and ready to use. We’ll be talking to Splice more about what’s new, where it’s going, how it was developed, and what this means for music making on the Web; stay tuned. In the meantime, I’ll say it again — don’t assume you’ll be throwing away your non-Web music software anytime soon. Web software is still extremely constrained in terms of access to the local file system and audio hardware inputs and outputs, for starters, meaning it’s actually technically impossible to have anywhere close to the feature set you get in offline apps. Furthermore, for high performance processing and low latency, audio apps actually have to get more intimate with the operating system than even typical desktop apps do, and require support for plug-in technologies and ASIO and Core Audio drivers … the list goes on. And that just about wraps it up for the browser. Where there may be new opportunity is in “rich clients.” Unfortunately, systems like Adobe’s Apollo — now AIR (Adobe Integrated Runtime) are extremely limited in comparison to so-called “native” development tools. In fact, the closest you’re likely to get is Java, especially if a Java app adds some additional desktop integration for the OS-specific dirty work; Java’s own internal APIs are in a woeful state as far as multimedia. But that’s not to take away from the importance — and surprise, rapid development — of tools like Splice. In fact, they demonstrate just how rich the experience can be when you add the Web. Future desktop music apps would do well to take a close look at these kinds of features.